While nursing shoes are rather unfashionable and often poked fun at by those outside of the healthcare community, proper footwear for medical professionals and healthcare professionals is a necessity. While these shoes have a less than stylish look, the nurses who wear them daily know that they are the most important thing they wear. Proper footwear for medical professionals reduces back strain, alleviates pain, provides support, and offers an added layer of protection, which makes them perfect for those who work in fields with a high occurrence of on-the-job incidents. Many jobs in the medical field are high stress, involve long hours on your feet, or involve complete concentration. Whether you are a student still in nursing school, or a surgeon, you know the importance of being comfortable and secure in your footwear. The physical, mental, and emotional stresses of working in the field can take a toll on your body, and wearing comfortable, protective, and supportive shoes is key to being primed to do your absolute best. 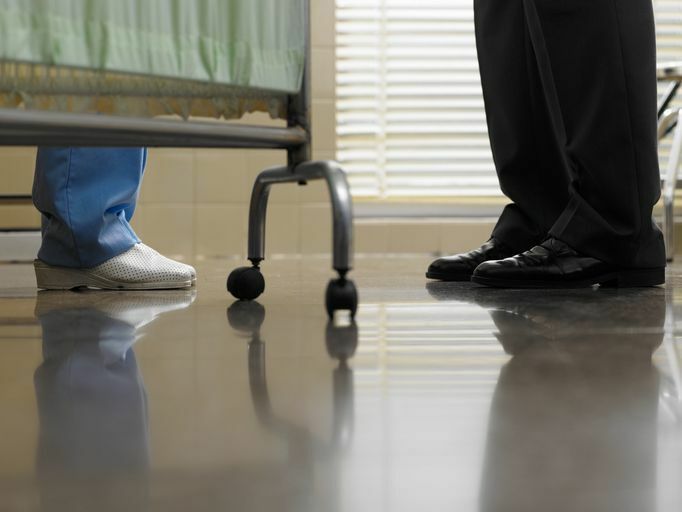 Many jobs in the medical and healthcare fields, such as nursing, involve long hours on your feet, which make the proper shoes an integral part of any uniform. These long hours can put undue stress on your ankles, hips, shoulders, and back, which can create chronic pain over time. Shoes with heels, without skid resistance, that do not offer proper support, or are incorrectly sized can have large negative impacts on your body all the time, especially if you work on your feet or are in a high stress position. It is important to take care of your body properly in the face of excessive wear and tear and external stressors to make sure you live a pain free and functional life.